The cast from Hero: Inspired by the Extraordinary Life and Times of Mr Ulric Cross: John Dumelo, left, Fraser James, BPTT president Claire Fitzpatrick, Nickolai Salcedo and Peter Williams. THE SPARK for a film chronicling the life of late Trinidadian jurist, diplomat and decorated Royal Air Force navigator Phillip Louis Ulric Cross was the death-bed wish of eminent attorney Desmond Allum SC. 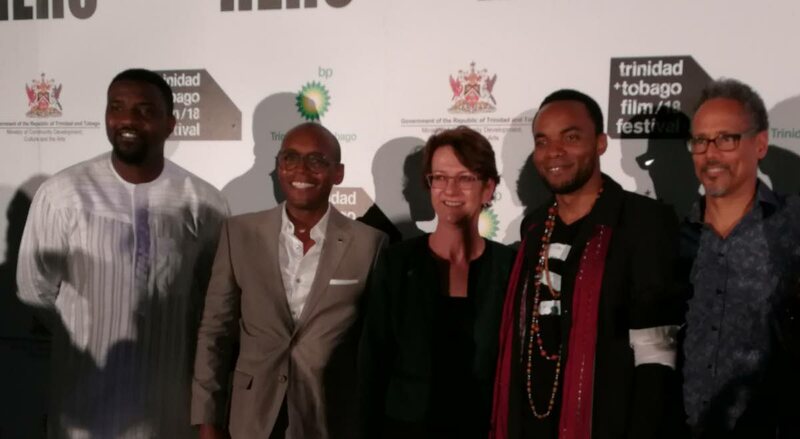 This was revealed by director Frances-Anne Solomon on Tuesday at the premiere of Hero: Inspired by the Extraordinary Life and Times of Mr Ulric Cross, at the TT Film Festival (TTFF) 2018 Opening Night Gala held at the National Academy for the Performing Arts (Napa), Port of Spain. The film stars Trinidadian actor Nickolai Salcedo, Jamaican-born Peter Williams (Stargate SG-1, The Chronicles of Riddick) and British actor Joseph Marcell (Geoffrey the butler from Fresh Prince of Bel-Air). Solomon told the gathering she was grateful to everyone who gave to this movie. She thanked TTFF founder and festival director Bruce Paddington for providing the platform and Wickham for the job she did. She recalled in 2010, Allum called her mother and close family friend and told her he was dying, and he wanted her to promise to make a film about Cross. Solomon described the film as a great weight on her shoulders over these years and recalled following Cross from Trinidad, where he was born and raised in Belmont, to England where he became the most-decorated West Indian ex-serviceman, to Africa and to Ghana. She said she and her editor and line producer did not sleep for four days getting the film ready. She said the film was not finished yet and she invited comments. Cross died in October 2013 at age of 96 before the film was completed but it includes some brief interviews with him. Hero executive producer Lisa Wickham said the film was the culmination of five years of passion, dedication and grit created by Stewart and led by Solomon and a cast and crew that spanned four continents. She recognised Republic Bank which invested significantly not just in finances but time and patience over the five years of the film and also thanked other companies and individuals who contributed to the film. She also thanked those who travelled into Trinidad for the film including Williams from Canada, British actor Fraser James who left the set of Terminator in Hungary, John Dumelo from Ghana and the recently-married Salcedo. Reply to "Cross docudrama fulfilled a death-bed promise"